This blog can practically be read as a tribute to chandeliers, decorating with chandeliers, the decorating of chandeliers, and the reselling and hacking of chandeliers, but one thing regular blog readers might not know about me and my chandelier fixation is that I frequently use chandeliers for utility lighting. I visit thrift stores and Habitat for Humanity ReStores regularly. My general rule of thumb is, unless it is damaged or just ugly beyond salvation, I’ll buy any chandelier under $20. Most of these chandeliers get painted and resold and a few get modified and used in my house, but inevitably I end up with a few sitting around in my storage space waiting for space in my flea market booth to open up or for me to have time to convert them to lamps. Rather than adding to the clutter of my garage by setting the spare chandeliers on shelves or risk damaging them by setting them on the floor, I began to hang chandeliers from bike rack hooks already mounted on the ceiling of my garage. Then, as I was making my original set of horse head wreaths in 2013 and bemoaning the lack of good-enough lighting to work with dark greenery wreaths in my garage after sundown- the obvious inspiration struck: put the chandeliers that were hanging in storage to work as task lights in the part of my garage I keep open for creative projects. 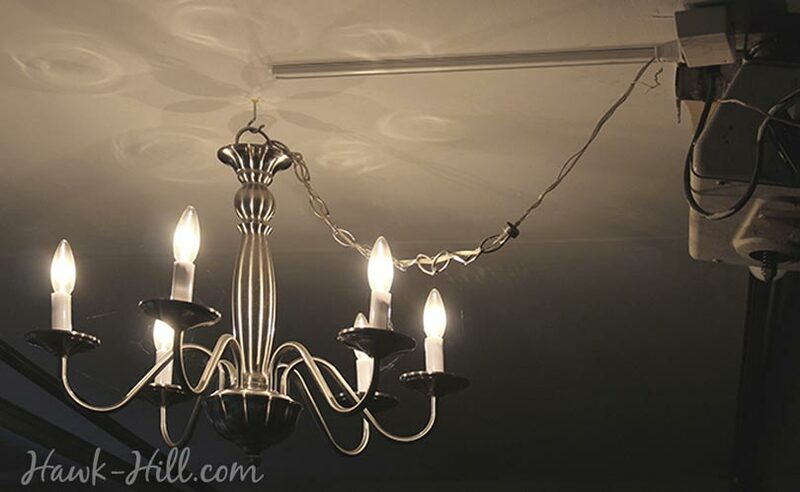 In this photo you can see the chandelier hanging from a simple ceiling hook, with a plug attached to the cord and plugged into a small box which remotely controls the chandelier’s on/off. Hanging the chandeliers was super easy, since my garage, like most, has outlets on the ceiling meant for easy installation of garage door openers. It was a snap to add some plugs to chandeliers (see my tutorial on that here) and wireless switches so I could turn the light(s) on and off with a switch at the door. It turns out, chandeliers work great for garage lighting and it turned into a fun joke with my family about my car’s taste in classy lighting. 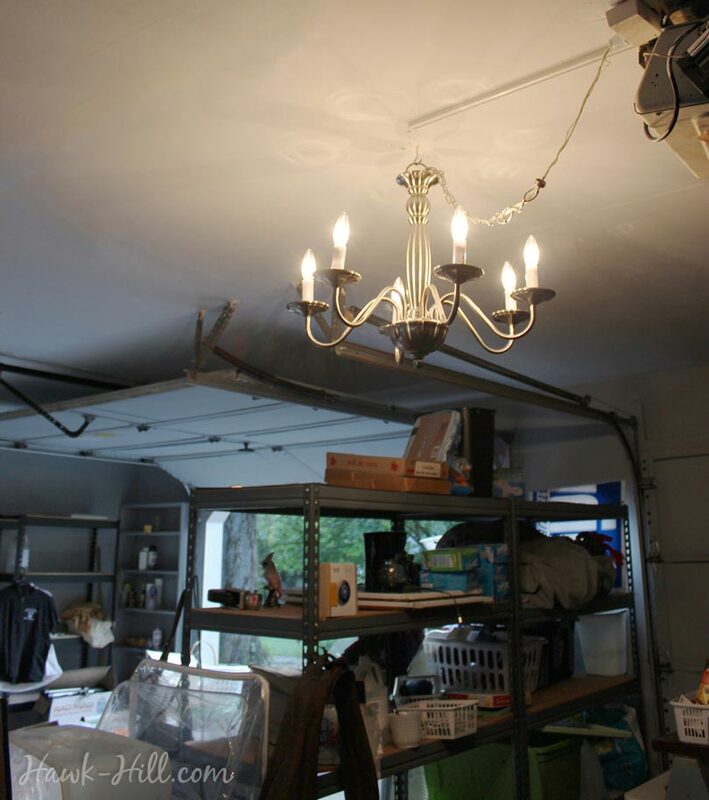 hanging a chandelier in the garage (or from any ceiling) just requires an appropriately sized hook mounted in a secure spot on the ceiling, a chandelier rewired to plug in to an outlet- and an outlet within cord’s reach.